Much has been reported recently in the press about the damage to the eyes of exposure to blue-violet light. One leading Ophthalmologist has bought up a large stock of tungsten filament light bulbs to use around the home, such is his concern! Blue-violet light has been identified as being harmful to retinal cells which can accelerate the onset of Age-Related Macular Degeneration which causes a blind spot in the centre of your vision and treatment can be limited or ineffective depending on type. Blue-violet light is transmitted by low energy bulbs (compact fluorescents) and most modern digital devices including tablets, smartphones and computers and outdoors, present within the Ultra Violet (UV) radiation spectrum and is present even on cloudy or rainy days. 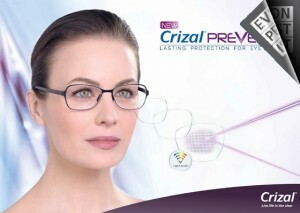 Here at Eyeworks, since last autumn, I have been recommending a new protective coating on my premium lens ranges called Crizal Prevencia TM which gives 25 times more protection against these harmful rays than without lenses. As an added bonus, by letting more visible light pass through, it helps regulate sleep/wake cycles, mood and cognitive performances. The staff here have been as good as gold since wearing them, so I am very pleased with this added benefit! If you would like to know more, please call in to the practice and start protecting your eyes especially if your job is computer-based or you are surrounded by low energy bulbs at home. I can't guarantee a good nights' sleep , but I can help preserve the precious gift of sight.